Monsoon Often be regarded as most unfavourable time for overall health and well-being. By incorporating some minor changes in our daily skin, hair & body care routine we can help keep ourself fresh, fit, healthy and glowing during. Today I’m Sharing With you, Some simple remedies to treat your Skin, Hairs & Body better In Monsoons ! It makes your skin and hair look better. The vitamin A found in tomatoes works to make skin and hair strong and shiny. For Hairs : Apply a mixture of tomato puree and curd on your scalp and hair for 15 minutes and see it work wonders! For Skin : Apply a mixture of tomato puree and honey on your skin for 5 minutes. It gives instant sheen to your skin and it also acts as a natural bleach. Turmeric is a powerful spice with an impressive list of uses & benefits. It’s known for its antioxidant content & ability to work as an anti-inflammatory. Mix all the ingredients Well , Apply it all over your Face & neck . Leave it for 15-20 minutes & wash it with cold water . – 1 tea Spoon Coconut / Sweet Almond oil . Make a thick blend and apply it uniformly on your face, let it dry for 20 minutes and wash it off with plain cold water. Blend It Well & Drink This Glass of Goodness Daily Before Bedtime . Beneficial For Little Ones Too. – 2-3 table Spoon Gram flour – 4-5 Drops Of Mustard oil/almond oil – Water as per the consistency. Prepare a Soft dough by combining all the ingredients. Gently rub This Dough in opposite direction to remove facial hair. There are Many More Other Amazing Benefits Of using Turmeric to your day-to-day Life. Use any one of these & Feel the Difference during Monsoons For Some Incredible Results. Invest In Some Good Exfoliating Products Today & Your Skin will thank you for it Tomorrow. This Golden rule is also to be applied even its cloudy outside. Your skin deserve Some TLC during rainy days as well. Try this, Magical Exfoliating Scrub Recipe Using Some Simple Kitchen Ingredients to exfoliate your skin during Monsoons. Take 1 table spoon of Finely blended Almond powder, 1/2 tea spoon of Kashmiri Honey, few drops of JOJOBA/Avacoda/Sweet Almond oil , Mix all together well with Pure Rose Water. Make A Thick Paste ! Apply this Mixture On Your face n Gentley massage for 5-7 mins in circular motions and Heart Shape strokes. It Helps In Gentle Exfoliation , buffs away all the dead skin, gives hours of moisturisation to skin , soothes ichty-dry skin, gives healthy nourishment to the skin & gives you Incredible glow to your face. Now You Are Ready To Enjoy The Soft , Smooth & Glowing Skin. Hair Doesn’t Make The WOMAN , But Good Hairs Definitely helps. Regular Oiling & Massaging is the Most Effective Treatment That We can Gift To our hairs. Give your hairs the much-needed TLC with a Blend Of These 3 Best Hair Oils. Result : It will Strengthen & Nourishes Your hairs , gives that perfect sheen & lustre , helps in preventing greying & prevents hair fall too. Vitamin C is an antioxidant which supports immunity protection from free radicals & growth and repair of body tissues. Therefore Vitamin C must be present in the diet. Many fruits and vegetables contain high amounts of Vitamin C. Dietary sources rich in Vitamin C include citrus fruits, peppers, broccoli, strawberries, Brussels sprouts, kiwi, tomatoes, and potatoes. I Suggest Do include these brightly coloured fruits and vegetables in your diet daily. The immunity level of our body becomes very low during monsoon. There are several infections taking place in the body which lead to number of diseases. The best way to boost immunity during Monsoons is by sipping some soups like tomatoes and mix – vegetables ,by sipping some green, wellness or herbal teas. My Current Favourite is Cardamom turmeric tea Wellness Infusion Tea from TE-A-ME. It’s the perfect way to detox our body with its active blend of golden turmeric, rich Indian spices, and fruity orange peel. TE-A-ME cardamom turmeric spice tea brings to you the restorative health benefits of a centuries-old recipe in the form of this wellness infusion. TE-A-ME cardamom turmeric spice tea brings to you the restorative health benefits of a centuries-old recipe in the form of this wellness infusion. The Hero ingredient of this Tea is Turmeric which is packed with antioxidants that flush out toxins and sustain life’s majestic flow, while spices like cardamom, ginger, cinnamon, clove, and black pepper are prized for their several preventative and curative properties. Containing these amazing ingredients, this golden turmeric spice tea blend detoxifies, improves immunity and keeps various chronic diseases at bay. I Hope You Find My Remedies Helpful. Do Leave Your Thoughts in the comments section below. And Do Spread The Word ! Sayeri from http://sayeridiary.com and Jhilmil from http://mommyinme.com For having this Fun Monsoon Carnival for all of us ! I am going to try the oil mixture that you have mentioned. I have coconut and castor oil at home. Never used tomato but heard a alot about it. Hey!! This post is very helpful and important for monsoon. I love drinking green tea and Turmeric milk during monsoons. Not only does it refresh me but it also boosts immunity and prevents me from falling sick. This is definitely the best tips to stay healthy glowing in this monsoon.. Turmeric is really a great option for skin..
Monsoon care of skin and hair is utmost important, and thank you for sharing such a helpful list. Many of us do not consider oiling hair much during monsoons due to stickiness, glad you pointed that out. Great tips ?? lakin tomatoes main shyad use na karu kyunki coloured hairs shyad fade ho jaye, baaki skin per to wow hai ?? Hair oiling avoid karti thi per ab jarur karungi ? Great tips and best part is all the items are easily available in our homes. Will try the tomato for sure. Tomato works good on hair? Didnt know this fact. But ya Turmeric has so many benefits. I will follow your skin exfoliation DIY pack. monsoon can create a havoc on hair specially. My hair gets frizzy in the monsoon! I love these tips you have mentioned. The tea looks promising too. I seriously needed to know about hair care for monsoona. The hair is at its worst condition this time. 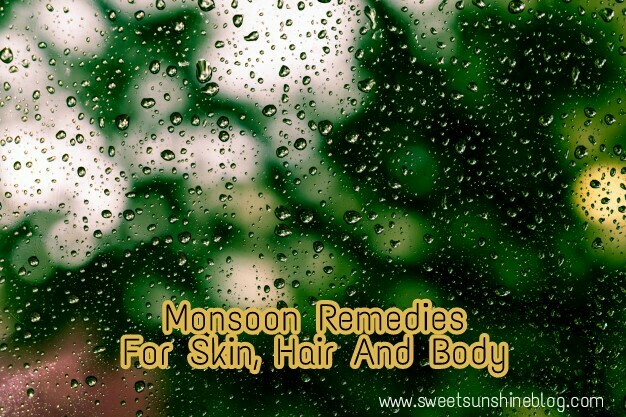 Some really cool tips for skin and health during monsoon. That DIY face mask recipe with turmeric powder was amazing. monsoons can be very difficult on the hair and skin.My hair gets so frizzy! These are nice tips to follow in monsoon. These are some great tips for monsoon. Will try out the mask it looks great for skincare. Such a helpful post for the monsoons. Particularly those amazing diy recipes. And yes, song on hit beverages in monsoons it’s a must for me! Thanks for sharing some tips with turmeric. And, green tea is best. It has amazing properties. Great tips. Monsoon makes our skins susceptible to infection n hence I think Turmeric as suggested by you, will be really useful. Indeed amazing tips for monsoon. And Teame teas are amazing.. i love them. I’m going to try the tomato hair pack for sure. This post is so helpful for everything. I oil my hair regularly and will use this combination you’ve mentioned next time. I loved this diy facial mask, simple and effective, will try soon. I normally don’t face too much trouble for my hair and skin during monsoons. But this time, I’m having terrible hair fall and very dull skin. Look forward to trying out some of your tips. I love monsoon but skin gt weird in monsoon. Like the tips. And sipping green teas is awesome idea. I love green teas. I agree our skin and hair does need special care during monsoons. Such lovely tips, I am definitely trying out the DIY mask with turmeric.